William Burnes came from Kincardineshire via Edinburgh to Ayrshire to work as a market gardener. There he met and married Agnes Broun (Brown) from Kirkoswald. Robert Burns was born on the 25th day of the first month of 1759 and was the eldest of William and Agnes's seven children. During the first seven years of his life, Robert lived in the cottage his father had built with his own hands in the village of Alloway. Although Robert grew up to a life of toil, hardship and poverty, his father saw to it that he was well educated and given the opportunity to read many books. His mother introduced him to folksong and this also was to help him greatly in later life. In the year 1766 the family moved from the 'Clay Biggin' to Mount Oliphant Farm. After the move Robert still attended the school at Alloway for a time. Later Robert received his schooling solely from his father at home. It was noted that Robert was an excellent 'English' scholar. His father paid great personal attention to his son's education in arithmetic, history of the Bible, geography, natural history and even astronomy. At the age of 12 years, 'to improve his penmanship', Robert was sent to the parish school at Dalrymple, which was 3 miles distant. At the age of 14 years Robert was 'boarded' for three weeks with a tutor John Murdoch at Ayr, to improve his grammar. Here he acquired a smattering of French and Latin. By the time he was 16 years old Robert was becoming increasingly the principal labourer on the farm. His health was badly affected by the heavy work and poor food, yet he never lost the love of learning; above all the poems of his fellow countrymen Allan Ramsay and Robert Fergusson. Despite the continuous hardships Robert was sent to Hugh Rodger's school at Kirkoswald to learn mensuration and surveying etc. when he was 17 years old. Unfortunately, Mount Oliphant proved a failure, and the family moved to another farm, Lochlea near Tarbolton. Robert worked with his father and other brothers on the farm; 'the cheerless gloom of a hermit, with the unceasing moil of a galley-slave'. He had been growing flax in Lochlea and in 1783 won a prize for growing the best flax in the district. To increase the earnings of the family he went to Irvine, the centre for dressing and weaving in Ayrshire and set up in that business with his mother's stepbrother. In the booksellers there he was to find the poems of Fergusson, the Edinburgh poet, which influenced him to write in his native Scotch language. On his father's death in 1784, Robert and his brother Gilbert took the farm of Mossgiel (Mauchline) a few miles away. Here again fate was not on their side and with Robert beginning to despair of his future in farming, he made some tentative plans to emigrate to Jamaica. To raise funds for the voyage, Robert decided to print his poems in Kilmarnock in 1786. In this he had been encouraged by an Irvine friend Richard Brown, who, as a sea captain, fought for the liberty of the Americans against the British. The American struggle for freedom, obvious in the poet's early poems can be attributed to Brown. Two days prior to his arrival in Irvine he had joined the masons. This collection of poems entitled "Poems, Chiefly in the Scottish Dialect, by Robert Burns, Kilmarnock" sold for 3 shillings (15p) and became known as the "Kilmarnock Edition". The collection received so much praise, especially in Edinburgh, that Robert gave up the idea of emigration and went to Edinburgh instead to publish a second edition of his works. In 1788 Burns married Jean Armour and moved to Ellisland Farm near Dumfries soon becoming both a farmer and an exciseman. By now, however, he wanted to give up farming and in 1791 he moved to Dumfries to take up fulltime employment in the excise. In 1793 he had a revised third edition of his works published in Edinburgh. 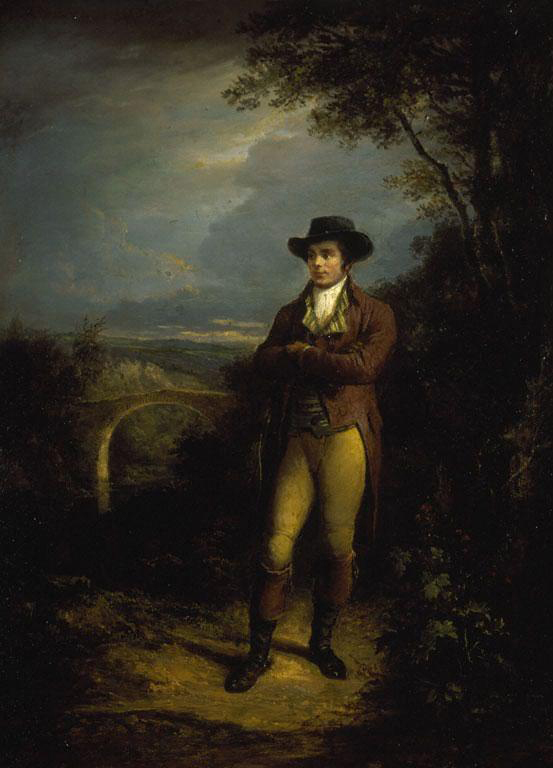 Robert Burns died in Dumfries on 21st July, 1796 at the age of 37 years. By the time of his death in 1796 Robert Burns was wornout, physically ill with a recurring heart condition. He had expended a great deal of energy throughout his short life particularly in these last 8 years, combining the work of Ellisland Farm with the duties of an Excise Officer, often covering 200 miles a week, in all weathers, on horseback. Ellisland Farm two different collectors Johnson and Thomson. Not withstanding this enormous effort, he managed to produce works of such enduring sentiment that today they still have the power to attract admirers all over the world. In Scotland, Burns is more than a poet, he is seen as a kind of hero whose birthday is celebrated by Scots not only at home but all over the world. His fame has even aroused great interest in countries as far away as Japan and Russia and in these and other countries, Burns Suppers are fast becoming an annual event. Burns is perhaps best known to many for his tale of witchcraft "Tam O Shanter", and his song "Auld Lang Syne ".